I don’t have any strong feelings about OSs. They are just tools. I had been a Mac user for 10+ years since I was 10, and now I’m using Windows for no reason. All OSs have their pros and cons. For example, I like Mac, but, in the late 90s, I was very disappointed at Mac because it didn’t have fonts to display Shift_JIS art nicely. This is because rlang.dll is used by the current R session (or other session? ), so Windows won’t let me overwrite it. What should I do? Here’s some advice. This is always necessary. Since rlang is very fundamental package, it might be loaded as a dependency of some attached or loaded package (if you are curious about the differences between load and attach, R Packages helps). You need a fresh session with no packages (except for base packages) loaded. 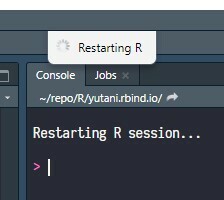 On RStudio, Ctrl+Shift+F10, or “Restart R” in “Session” menu. devtools::install_github() is just re-exported from remotes package. So, are the same one. But, if I use devtools::, devtools’s dependencies are loaded, and, at the moment, rlang is included here. So, the same error will occur. Note that, pkg package seems aware of this kind of problems, so we’ll be free from this kind of problems when pkg is mature! Removing package might help, since removed package cannot be loaded. If you really need to be away from RStudio, or even from any R sessions. In those cases, you can use git and R CMD build and R CMD INSTALL on console.